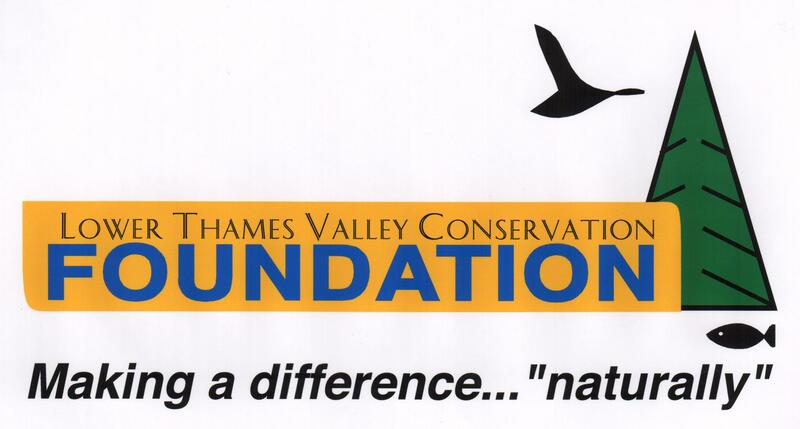 Donations in memory of Dr. Lewis Carey are being accepted by the Lower Thames Valley Conservation Foundation for the Carey Carolinian Trail and Arboretum. Displays about Carolinian Canada and the Arboretum and Trail at Longwoods are found in this Kiosk. Pale Jewelweed Impatiens pallida This plant grows 3-6’ tall in moist forest and wetland soils in Ontario. It has a small (1-11/4”) yellow snapdragon-like flower which provides pollen and nectar for bumble bees and Ruby-Throated Hummingbirds. The seedpods split and eject the seeds when ripe. Seeds from this plant provide food for Ruffed Grouse and Deer Mice. White-tailed Deer browse on the foliage. The stems of both Pale Jewelweed and it’s cousin Spotted Touch-Me-Not (Impatiens capensis) are succulent and can be opened and applied to skin which has been in contact with Poison Ivy (Toxicodendron radicans), providing a barrier as well as relief to the inflammation and itching caused by Poison Ivy’s oil. Blue-spotted/Jefferson Salamander Ambystoma laterale/ jeffersonianum Are you ready to be confused? Blue-spotted and Jefferson salamanders are separate species but can’t be distinguished from each other without genetic testing. Their complicated genetics are still puzzling scientists. Jefferson Salamanders (Ambystoma jeffersonianum) are endangered under the federal Species at Risk Act but Blue-spotted Salamanders (Ambystoma laterale) are not on this list at all. Where their ranges overlap as they do in Southern Ontario, they can hybridize which complicates things further. So here in Ontario it’s safest to combine their names when referring to them. These nocturnal (active at night) salamanders are found in both deciduous and coniferous forest areas and swamps. Like most salamanders they can be found under leaf-litter and branches on the forest floor, especially on warm rainy nights. Requiring temporary swamps or wetlands to breed the females can deposit around 200 eggs singly or in small clumps on underwater vegetation. Eggs laid in early spring take about a month to hatch and the larvae transform into adults in mid-summer. Blue-spotted/Jefferson Salamander adults are carnivores eating many insects and other small invertebrates like worms and spiders. Their beautiful blue colours are a treat to see. 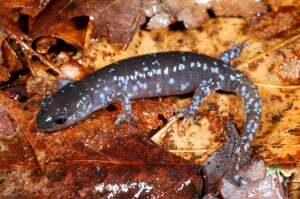 The depletion and degradation of wetlands and forest habitats due to urban, industrial and agricultural development pose the main threats to most wildlife and the Blue-spotted/Jefferson Salamander is no exception. Roads through breeding migration routes also contribute heavily to their losses. Monarch Butterfly Danaus plexippus Monarch Butterflies have a complete life cycle, which means they have an egg, larva (caterpillar), pupa (chrysalis), and adult stage of development. Monarchs have a complex cycle of generations. Some spend their lives as residents of Canada and the U.S.A. while others migrate huge distances and hibernate overwinter “down South.” Adults which have hibernated all winter in Mexico and Texas emerge around February and mate. They then travel north and eastward and lay their eggs (which we’ll call Generation #1) on various types of milkweed plants during March and April. The eggs hatch in four days and the brightly patterned caterpillars feed on the toxic leaves of the milkweed plants. The poison in these leaves protects the caterpillar throughout its larval stage as well as protecting the brightly coloured adult butterfly from predators. Two weeks after hatching the caterpillar attaches itself to a stem and constructs its chrysalis. A remarkable transformation called metamorphosis occurs within the chrysalis during this time and ten days later, a beautiful adult butterfly emerges. This adult will live for about two to six weeks, and feeds on nectar and pollen. It mates and lays eggs then dies. These “next generation’s” eggs (Generation #2) hatch in May and June, and the whole butterfly life cycle repeats itself. The succeeding generation’s eggs (Generation #3) hatch in July and August, with the life cycle repeating exactly the same. Things change with the eggs that hatch during September and October. The exact same development process occurs for this Generation #4 except the adults don’t die after two to six weeks. Instead the adults migrate south huge distances to California, Texas and Mexico, where they live for six to eight months. They hibernate over the winter, and then make their incredible journey northward again. 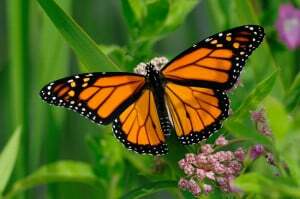 The Monarch is just one species of insect that we are in danger of losing. Because of habitat loss, hurricanes, pesticides, pollution, alien species and traffic related losses, these butterflies face a dark future unless we act to help them. Planting various types of milkweed plants will help these insects during their developmental stages and ensure these beautiful pollinators can remain with us. 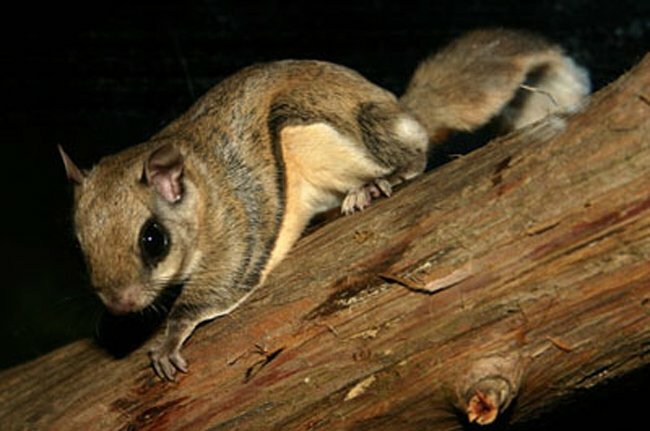 Southern Flying Squirrel Glaucomys volans The southern flying squirrel weighs two to four ounces and has a body length of eight to ten inches making it the smallest of all tree squirrels. It has a loose fold of skin called a patagium which stretches between the wrists of its fore and hind legs. The skin fold acts as a sail, parachute and glider wing all in one. They can glide distances of 80 yards or more, and maneuver using their wrists and their tails to steer. These squirrels have a very silky coat that is grayish brown above with a white under-belly. Southern Flying Squirrels have belly fur that is white right to the base of the hair, while the Northern Flying Squirrel (Glaucomys sylvatica) has white belly hair that darkens toward the base. Both squirrels have a densely furred tail as well as large black eyes for nocturnal vision, since they are active during the night. Their call is faint and bird-like and can be heard in early evenings in the spring and summer seasons of the year. Glaucomys volans is present in Canada only in Southwestern Ontario but can be found throughout the eastern United States except for northern New England and the southern tip of Florida as well as west of Minnesota, eastern Kansas and eastern Texas. They prefer mature hardwood forests but can be found in other forested areas. These squirrels construct nests of leaves, twigs and bark in old woodpecker holes. They remain active through the winter and will nest together with other flying squirrels to conserve body heat. Flying squirrels eat invertebrates like insects, centipedes, earthworms and spiders and may also eat bird eggs and nestlings during spring and summer. The majority of what they eat consists of plant matter such as flowers, fruit, seeds, buds and berries. Building and placing nest boxes can help squirrels in areas where tree cavities are limited. These boxes are readily used and may increase the number of flying squirrels. Nesting boxes are often used as food caches (hiding places) which indicate that boxes are used as feeding stations. Squirrels most often use nest boxes in the fall and winter months when cold temperatures prevail, but they will also raise their young within them. They can mate and produce young at 10 to 11 months of age and have and average litter of one to four young after a 40 day gestation period. Eastern Redbud Cercis Canadensis Commonly called redbud, this tree is a deciduous, often multi-trunked understory tree that can grow to 30 feet tall. 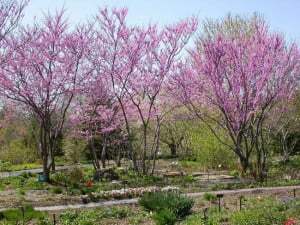 In the spring, redbud is known for its beautiful rosy-pink flowers, which appear before its leaves emerge. The redbud is a Carolinian Eco-Zone species which occurs in Canada naturally only in Southwestern Ontario. It grows southward all the way to Western Texas and Florida. Redbud flowers are ½” wide and bloom in clusters of four to ten. Once pollination and fertilization occurs, a two to four inch long bean-like seedpod develops. Each pod contains six to twelve seeds that may remain on the tree into the winter. After the blossoms, the three to five inch wide heart-shaped leaves emerge. The leaves will turn pale yellow to greenish-yellow in the fall. Rose-breasted Grosbeak Pheucticus ludovicianus This bird sings frequently throughout the spring and summer in its deciduous forest habitat. Overwintering in the tropics, the male of this grosbeak species brightens our springtime with its bright colours. 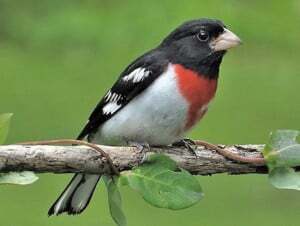 The Rose-breasted Grosbeak forages mostly in shrubs and trees, searching for insects, seeds and berries. Hovering to take insects from foliage or bark, this bird can also catch insects in mid-air. Three to five pale blue-green eggs with brown spots are laid in the spring. Both parents incubate the eggs and feed the nestlings, which leave the nest about 9-12 days after hatching. The male watches the young fledglings while the female starts a new nest for the second series of eggs. The female uses twigs and leaves to build a cup-shaped nest, which it lines with finer twigs, rootlets and hair. Silver Shiner Notropis photogenis The Silver Shiner is a slender minnow growing to 14 cm long. Possessing a dark stripe that runs down the center of its back, its upper body has a blue-green iridescent colour. There are two dark crescent markings between the nostrils. This fish lives in moderate to large sized streams with swift running currents. It prefers a plant-free substrate with gravel or boulders present. Here the Silver Shiner feeds on crustaceans and insects that fall into or fly just above the water surface. Spawning in June-July, they scatter their eggs over gravel that has fast running water flowing over it forming a riffle. In Ontario the Silver Shiner is found in the Thames and Grand Rivers as well as Bronte and Sixteen Mile Creeks, which flow into Lake Ontario. These fish are threatened by pollution, alien species, stream channeling and damming and habitat loss and degradation. 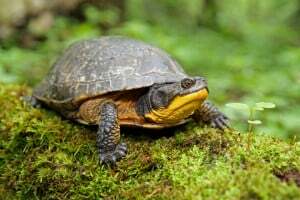 Blanding’s Turtle Emydoidea blandingii This turtle is found around the Great Lakes and Southern Ontario. Blanding’s Turtles can be identified easily, since they have a high domed back shell (carapace) and a bright yellow throat which can be seen from some distance when they bask in the sun. They also possess a hinged plastron (abdominal shell) which allows them cover when they tuck their head and front legs into the shell. Inhabiting lakes, ponds and wetlands with clean water, these turtles may have to travel several kilometres between summer nesting sites and winter hibernation sites. They require mucky bottomed waterbodies in which to hibernate. Females cannot reproduce until they are 14 years old. They lay up to 22 eggs in a sunny, well-drained area and hatchlings emerge in the fall. Hatchling gender depends on the incubation temperature their nest has reached. Eggs which have temperatures below 25 °C hatch as nearly all males, while those 30 °C or above hatch as nearly all females. Being omnivorous, Blanding’s Turtles eat plant material, insects, fish, frogs and crayfish. Shoreline development, wetland habitat loss, the pet trade and vehicles on roadways have significantly decreased the populations of these turtles. They are currently listed as Threatened under the federal Species at Risk Act. 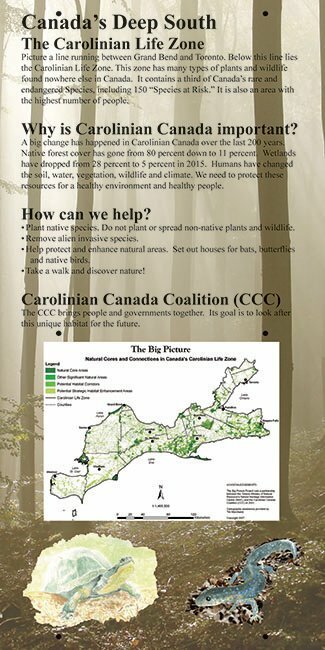 Planted in 2014, the Carey Carolinian Arboretum and Trail Kiosk Gardens promote biodiversity and demonstrate to gardeners how effective, beautiful, and beneficial floral gardens and native species can be. Twenty five native plants are represented. These plants grow well in the sandy loam soil condition of the local Caradoc Sand Plain. Four gardens contain sun and partial-sun plants while the garden next to the entrance of the Longwoods Road Conservation Area’s Resource Centre contains shade plants. Most of the sun-loving plants were components of the tallgrass prairies that once blanketed parts of southwestern Ontario. The shade-loving plants do well in our Carolinian Eco-Zone forests. These plants and gardens will serve school and volunteer groups as seed banks for local forest restoration projects and will help spread the message of respect for and stewardship of our natural heritage. Our forests face many threats ranging from alien invasive species to deforestation. All of these plants have important benefits for field and forest, water, soil, wildlife, and even ourselves.